Are you feeling down? Could you use some feelgood energy? 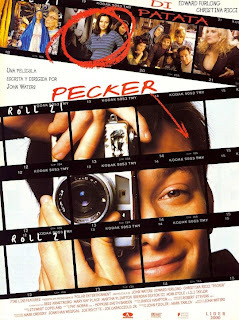 If so, there is not much that will cheer you up as much as seeing Pecker. Not only is it a film full of good vibrations, it also features a merry bunch of misfits the likes of which you have never seen, and if there is any message it is simply that everyone are ok. It doesn't matter if you're a homeless fashion addict, a seven year old sugar junkie, a religious ventriloquist, or if you have a name that sounds ominously similar to genitalia. Everyone are awesome! Written and directed by the one and only king of trash cinema John Waters, as is expected there are no taboos and the only judgement falls upon those who judge, in the form of quirky satire about stereotypes and prejudice. See Pecker today, and feel better about yourself for the rest of the week.